Welcome to Oda! Oda is a smallish town, as many in Shimane are, but one that has its share of interesting things to see and do. Well known for being the home of Mt. Sanbe, Shimane’s tallest mountain, as well as World Heritage Site Iwami Ginzan (a silver mine), Oda is practically the midpoint of the prefecture along the coast. Because of this, you will often see beautiful seascapes along the main road, Route 9. Also, you’ll find yourself conveniently able to reach most places in the prefecture without too much trouble. With a modest population of about 40,000 people, the town is quaint but friendly and welcoming. Although Shimane is one of the more rustic and rural parts of Japan, you’ll quickly find yourself acclimated to the relaxing and easy-going lifestyle many here have come to take for granted. If you’re concerned about living in the country, fear not! Oda has all you need and lots more that’s waiting to surprise you. Iwami Ginzan: Active from the 16th century until its closing in the early 1900’s, Iwami Ginzan was the largest silver mine in Japan’s history. The silver from Iwami Ginzan was exported worldwide and became a staple within the East Asian trading lines because of its high quality. The impact of Iwami Ginzan and its surrounding areas received recognition in being named one of UNESCO’s World Heritage Sites, which denote important international landscapes that hold aesthetic or cultural significance. Iwami Ginzan has tours in both Japanese and English in which guides explain the history of the area while tourists can explore the mining areas themselves. Omori: Town that was built around Iwami Ginzan which was bustling and flourished back in the days of the silver mine’s international exporting. Designated part of Iwami Ginzan’s World Heritage Site, Omori has been preserved by Japan’s government and is a picturesque locale of what rural Japan represents. 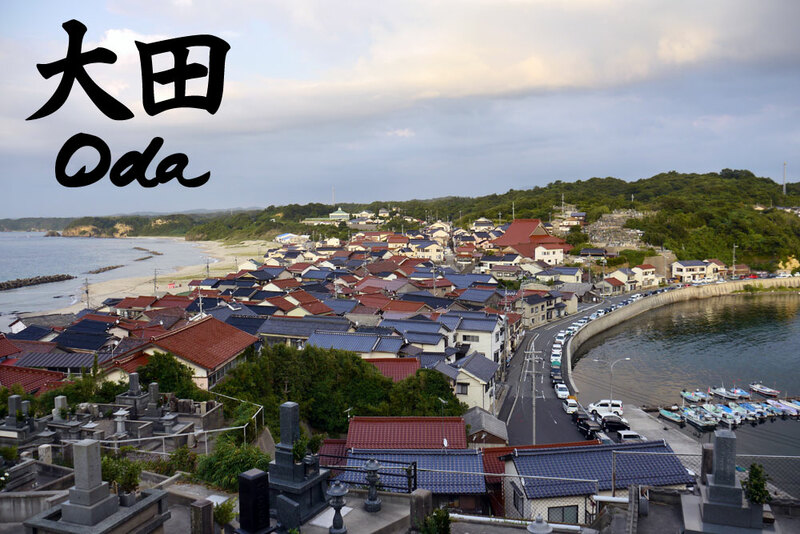 With small businesses still surviving and tourist attractions such as The Merchant House, Omori’s small population, shopping, and sights make it one of the must see places in the Oda area. Mt. Sanbe: Standing at 1,126 meters high, Mt. Sanbe is the highest mountain range in Shimane Prefecture. With a beautiful view from the top and a juicy “Sanbe Burger” at the bottom, a day at Mt. Sanbe is a good hiking workout combined with a taste of big American style burgers. Nima Sand Museum: Holding sand from the Oda’s own Maji beach, the Nima Sand Museum has the world’s largest hourglass which is perfectly timed to elapse at 1 year – an annual party on the night of December 31st hosts people to join in the celebration of the New Year by flipping the hourglass to restart the clock. Immediately recognizable by the building’s glass pyramid structure from outside, the Nima Sand Museum is another one of Oda’s tourist attractions for everyone in Japan. While small in size and population, Oda still has all the basic amenities necessary to keep JETs happy and healthy during their stay. The city has numerous medical clinics for treating common ailments, though more acute conditions and emergencies are generally handled by the prefectural hospital in Izumo. Oda also has a number of dental clinics capable of treating any problem. A variety of drug stores will keep your medicine cabinet well stocked, provided you know what you’re looking for, and know how to say it in Japanese. Banking for all JETs in Oda is handled by San-in Godo Bank, which has multiple branches and ATM locations throughout the city. Post offices can also be found in varied locations around town, often within walking distance of JETs’ residences. Though Oda lacks the multistoried mega-malls of Izumo or Matsue, Oda has numerous grocery stores and a shopping plaza. Most JETs do their food shopping at the plaza’s Aeon due to its large variety (they even stock peanut butter and taco shells, a rarity for Japanese grocers). Also located in the plaza is a Juntendo (home improvement center), Haruyama (business attire), Fujiki (Japanese souvenirs), Mac House (casual clothing), Daiso (100 yen store), Kitamura Camera store, and more. It’s also home to the city’s only American fast food restaurant, KFC. Being a JET Programme participant provides the unique opportunity to participate in activities seldom offered in our home countries, and many JETs in Oda take full advantage of this. One of the most popular cultural activities among JETs here is taiko, or Japanese performance drumming. The Iwami Ginzan Tenryo Daiko group holds yearly workshops for beginners. Other JETs practice various martial arts, including karate, judo and kendo (Japanese fencing). If physical activities aren’t your thing, you can try your hand at shodo (Japanese calligraphy), or ikebana (flower arrangement). Opportunities abound here, and we fully encourage you to try everything you can! The great thing about JET is it brings people of all different types of backgrounds and personalities together. So while many people have come upon this program because of their interest in Japanese language and culture, there are equally as many people who come to Japan out of a need for adventure while making an impact in a community. Therefore, people enjoy or join just as many activities that pertain to Japanese culture as they do activities they bring from their lives before JET. Current ALTs in Oda have joined groups to sing with, sports clubs from school, and different types of groups to help others with speaking English or help themselves study Japanese. Maybe you like surfing, fishing, or time on the water. Maybe you love listening to music or late night gaming. Maybe you are a sports buff who enjoys playing competitively or simply watching. No matter what you are interested in, someone here does it or knows how you can get involved with people who do it. While your interests may not exactly line up with all of your friends you find on JET, your individual interests and experiences make for a better dynamic within your group of ALTs in Oda and the JETs around Shimane. Weekends with ALTs nearby can be expected regularly and monthly organized events usually bring most JETs from Shimane together for various activities depending on the season. Kute Fireworks Festival (early August): Held in the port side village of Kute, this festival is one of the largest fireworks displays in Shimane! Put on your yukata and take a walk by the sea while enjoying delicious festival foods. When night falls, the fireworks go up! Spring/Fall Equinox Festival (March 20th/September 20th): These festivals to celebrate the changing of the seasons take place in the heart of Oda’s downtown area. Most of the city comes out to enjoy the food and various taiko, yosakoi, and martial arts performances. A lot of your students will be there as well, so make sure to say hello! Oda is a good place for road trips. Due to it being about halfway down Route 9, not to mention it actually is crossed by Route 9, Oda’s a great starting point. There’s also some great eating choices in town that are along Route 9 so whether you’re stopping by Oda in the middle of a road trip or filling up before you go, you’re all set! *There is a JR station in town with trains running to all cities in Shimane from about 6 am to 9 pm. Discovered a good restaurant in Oda? Do you know a nice place for a walk? Has somewhere changed? Use the reply form below to contact us and keep this info current.